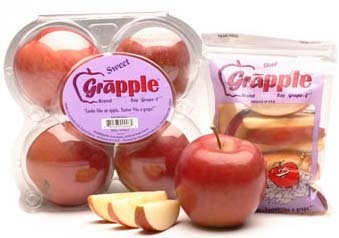 Get the sweet taste of a grape and the healthiness of an apple. The apple takes on no additional sugars or calories and they are not genetically altered in any way. Sounds like a good deal! What a funny idea! I like that. I’ve tried these. They just taste like apples with really bad artificial grape flavoring (nothing at all like the real thing). It’s a bit of a disappointment unless fake grape flavor is your thing.